Vienna Card or Vienna City Pass? 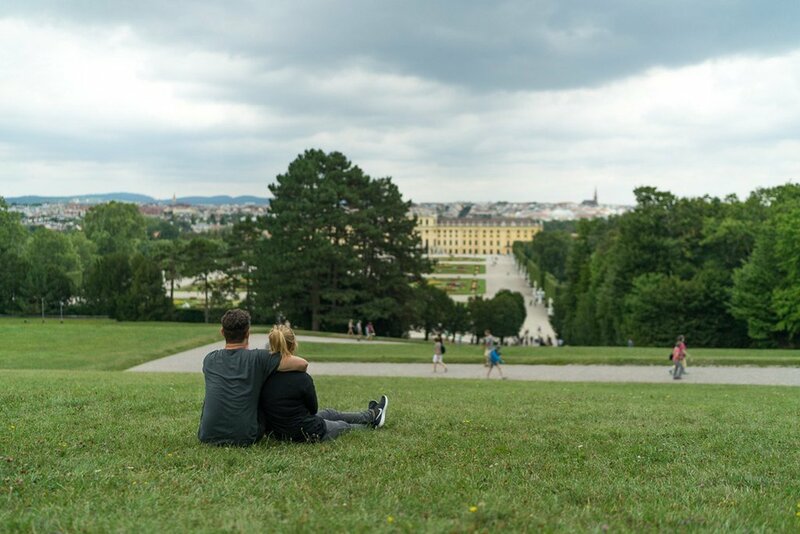 Vienna has been on our list of destinations for a long time and we made it there at last! We were enchanted by the metropolis on the Danube from the moment we arrived. We’ve rarely seen such a beautiful, but at the same time lively and livable city. Hardly any other city in Europe has as many sights to offer as Vienna. Every building in the city center seems to be telling a story and one highlight in Vienna chases the next. 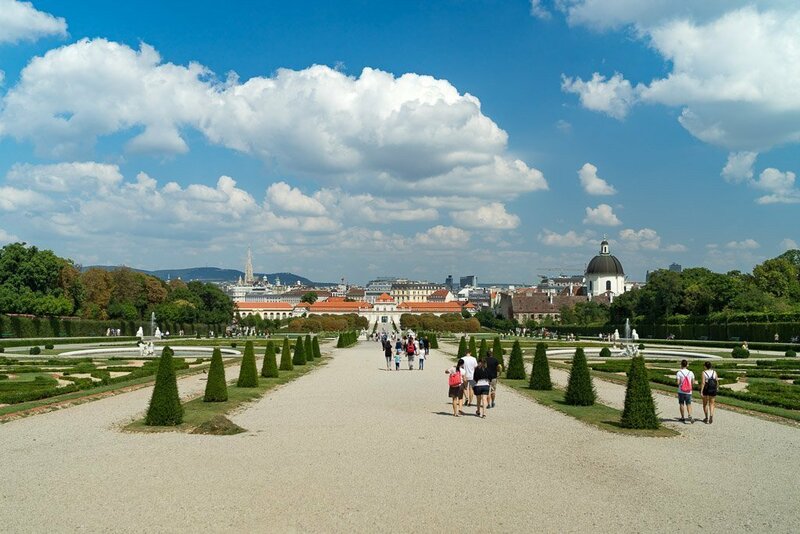 In this post, we’ll show you what you absolutely have to see and do while you’re in Vienna. 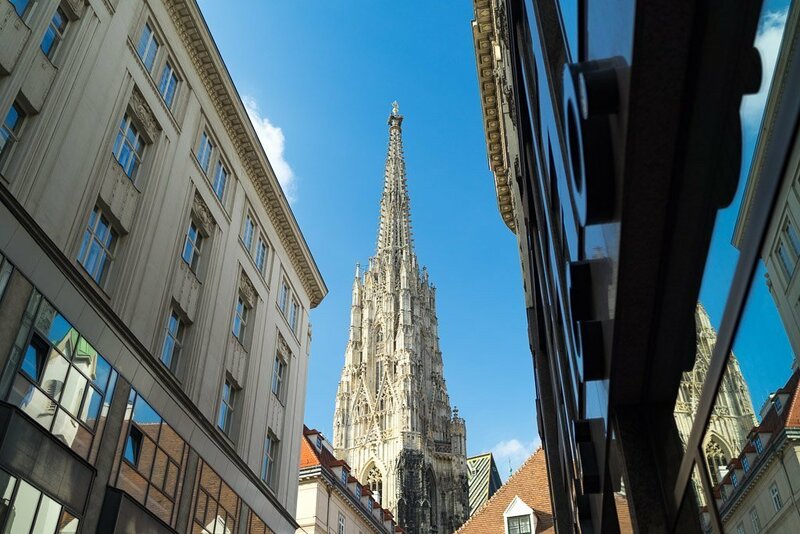 Of course, in addition to the sights, we’ve also included lots of practical information to help you plan and prepare your city trip to Vienna. Best district to stay in Vienna! 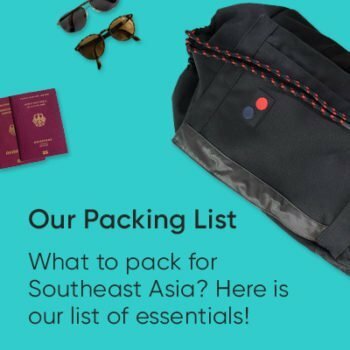 Where to stay! Vienna off the beaten path! 15 hidden gems! Many typical destinations for a city​trip in Europe have two to three highlights that every visitor should check out while they’re there. Vienna is a bit more complicated because there are just so many outstanding sights that you don’t know where to start. But don’t worry, we’ve put together a compact list of the most important sights in Vienna for you. Schönbrunn Palace is one of the main attractions in Vienna. The palace has 1,441 rooms (!) and the Palace Park and Gardens are the size of 220 soccer fields (!!). No wonder that you can easily spend a whole day in Schönbrunn without seeing everything by the end. But even if you don’t have that much time, it’s still worth visiting Schönbrunn. A walk through the Palace Park and Gardens is an absolute highlight. The ascent to the Gloriette on the hill behind the palace is especially worthwhile. It definitely gives you the most beautiful view of the palace. The Palm House and the small maze, both of them located in the Palace Park and Gardens, are fascinating too. If you like zoos, you should make sure to check out Tiergarten Schönbrunn. It opened in 1752, making it the oldest zoo still in existence. There are several options to visit the palace. Depending on how much time you have, there are different tours that go through a varying number of rooms. You can buy tickets for the palace in advance on the Schönbrunn Palace website so you don’t have to line up at the palace ticket office. 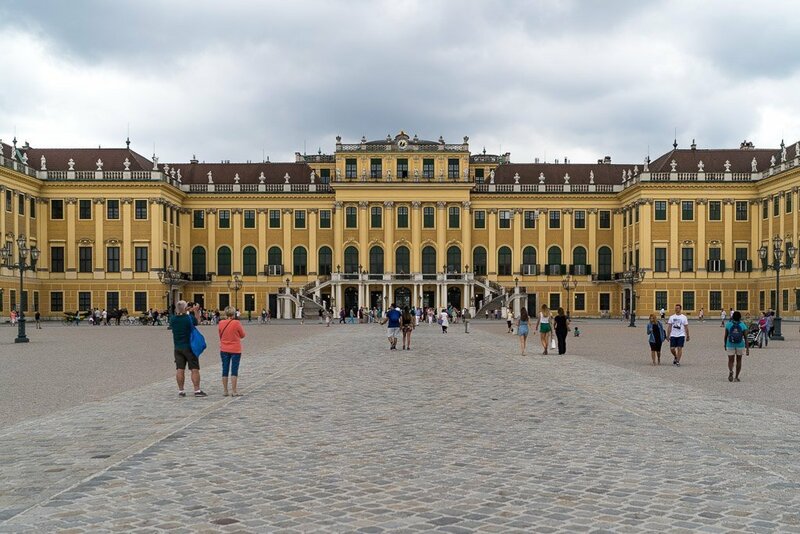 Tour through Vienna & Schönbrunn Palace – This package will take you on a sightseeing tour of the most important sights in Vienna including admission and a guided tour of Schönbrunn Palace. Schönbrunn Palace incl. concert – This package includes the admission to Schönbrunn Palace, a guided tour, and an exquisite classical concert in the Orangerie. Schönbrunn Palace incl. 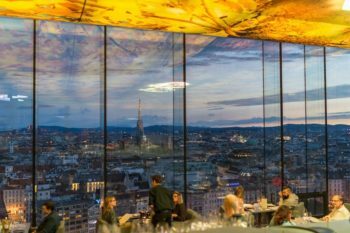 concert and dinner – With this package, you’ll be treated to a three-course meal at the Café Restaurant Residenz in addition to a guided tour and a concert. Schönbrunn Palace is one of the absolute top sights in Vienna. We enjoyed a short break on the way up to the Gloriette. The view from the lawn in front of the Gloriette. The Prater is known far beyond Vienna’s city limits. It’s actually a large nature and park area – the well-known amusement park only takes up a small part of the entire grounds. Nevertheless, the term Prater is often used as a synonym for the amusement park, which is officially known as “Wurstelprater”. The Prater is a typical amusement park with roller coasters and other rides, so not really anything special. 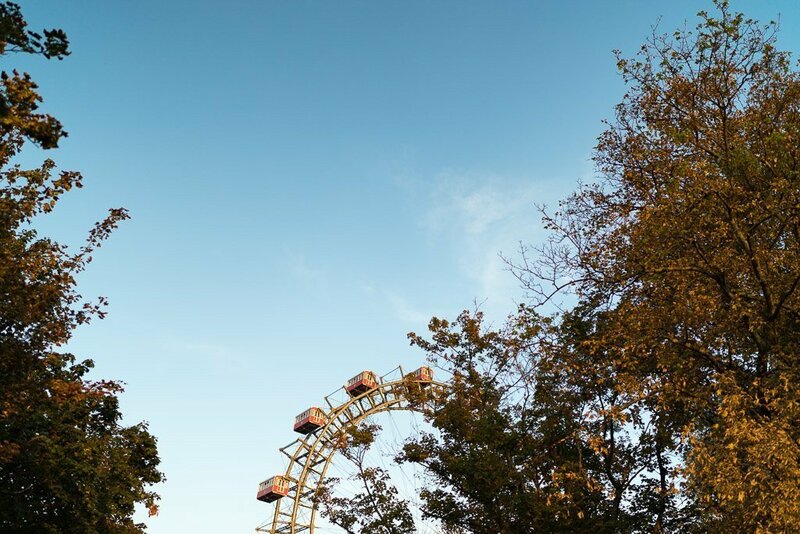 Even so, a visit to the Prater is an important stop on any city trip to Vienna because it’s home to one of Vienna’s most important sights, which is also the city’s most iconic landmark: the Wiener Riesenrad, or Giant Ferris Wheel of Vienna. The Ferris wheel has been standing on this site since 1897 and was one of the largest in the world at the time. A ticket lets you go exactly one round on the Ferris wheel. The ride is relatively slow though. One complete rotation takes about 4.5 minutes. If you add the time it takes for passengers to get on and off, it actually takes considerably longer. It’s a good idea to buy tickets online ahead of time. That way you can go straight through the turnstile without having to wait in line. The cheapest tickets are available at GetYourGuide: Tickets for the Wiener Riesenrad. 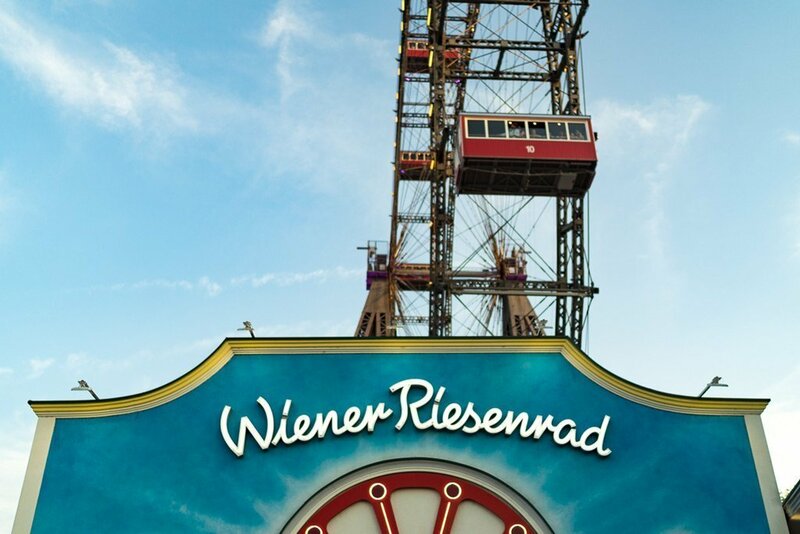 If you’re looking for a very special experience, you can also book a candlelight dinner on the Wiener Riesenrad. It makes for a beautiful romantic night out, but it doesn’t come cheap: Candlelight dinner on the Wiener Riesenrad. The Wiener Riesenrad – the Giant Ferris Wheel in the Prater – one of the most iconic sights in Vienna. The Ferris wheel is a great subject for photos, especially at sundown. 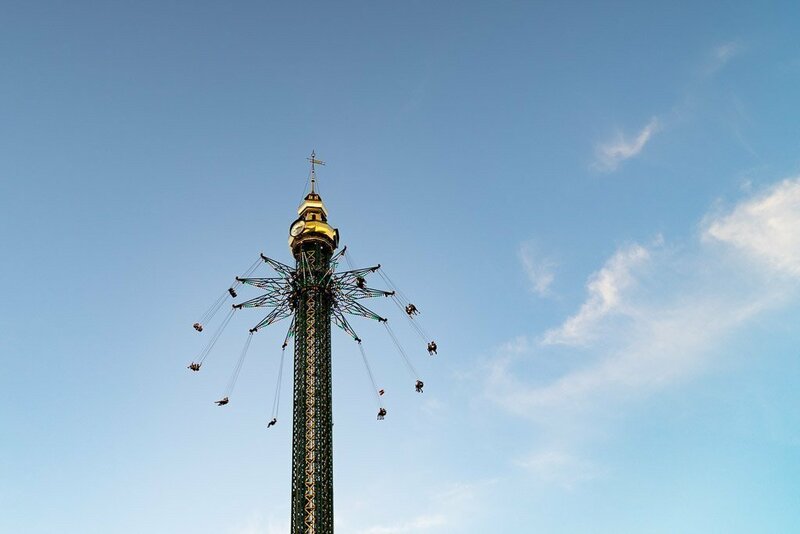 Many of the rides in the Prater will take you sky-high, giving you a great view of the many sights in Vienna. If you can concentrate on them that is. 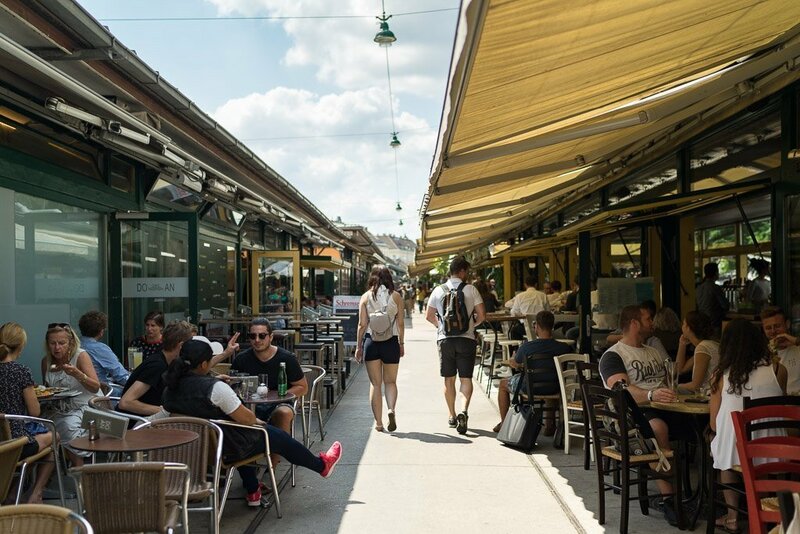 The Naschmarkt – which literally means “nibble market” – is a real institution in Vienna and has been around since the 18th century. More than 100 market stalls there mainly specialize in fruit, vegetables, spices, fish, and meat. Many locals do their day-to-day shopping at the Naschmarkt, but of course the market is also one of the most important sights in Vienna. There are also several restaurants in the Naschmarkt where you can get a bite to eat while exploring the city. The Naschmarkt in Vienna is one of the city’s most important sights. 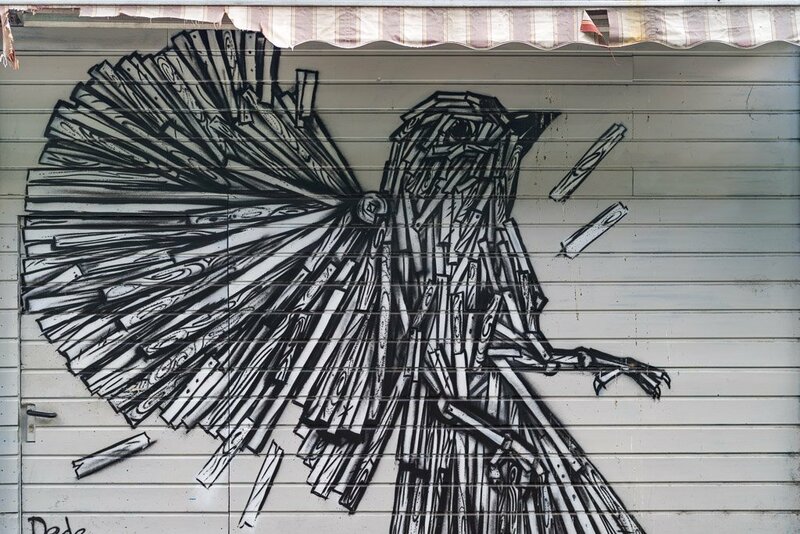 The Naschmarkt doesn’t just offer something to nibble on – you can also shop for art there. St. Stephan’s Cathedral in the center of the historic Old Town of Vienna is the second famous landmark of the city and one of Vienna’s most famous sights. Besides the church steeples, the roof with its zigzag pattern is particularly striking. A visit to St. Stephen’s Cathedral is also worthwhile for the great view. The 137-meter-high south tower is open to visitors every day from 9 am to 5:30 pm. Tickets are available on site. St. Stephan’s Cathedral in Vienna towers high above all the other sights in the 1st district. The Viennese Hofburg is one of the sights that no one should miss on a city trip to Vienna. The Hapsburgs resided in the Hofburg from the 13th century to the year 1918, and today it’s the official seat of the Austrian Federal Presidency. 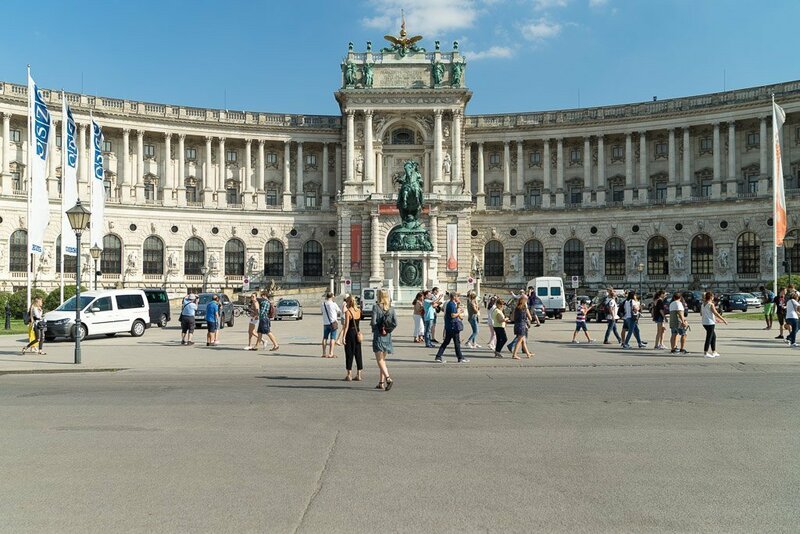 The Hofburg consists of several building sections, which belong to the most important sights in Vienna. These include the Spanish Riding School, the Imperial Treasury, and the Albertina museum. Tickets for the Sisi Museum, the Imperial Apartments, and the Silver Chamber are available directly on the Hofburg website. The combination pass for the Spanish Riding School and the Imperial Treasury is a very good deal, where you save 8 euros per person compared to buying them individually. You can buy the combination pass online here. Online tickets are also available for the magnificent Albertina museum: Albertina tickets. It costs the same as buying them on the spot, but at least you get to skip the line. The New Castle, a part of the Hofburg. The MuseumsQuartier is a remarkable area consisting of nine cultural institutions. Art lovers will be in paradise here. The most popular are the Leopold Museum (tickets available here) with numerous works by Egon Schiele and Gustav Klimt, and the mumok with numerous works by important representatives of modern art. The Belvedere is one of the most beautiful and important Baroque buildings in Europe and is the last highlight on our list of things to see in Vienna. The Belvedere with its magnificent palace gardens is a real sight to behold, both from the outside and from within. 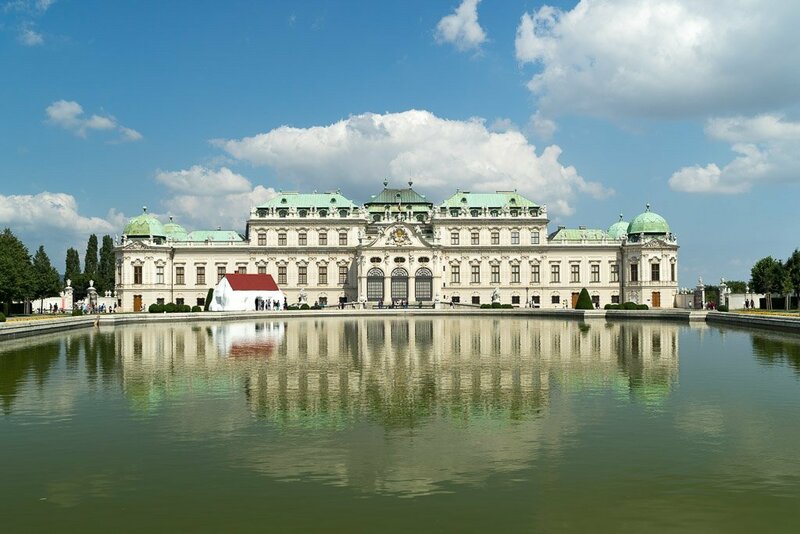 Today the palace also houses the most important collection of Austrian art and the world’s largest Klimt collection. The Belvedere consists of two buildings: the upper and the lower Belvedere. Tickets for both buildings can be purchased individually or as a combination pass for both parts, which is a better deal. You can buy your tickets at the door or online here. View of the city from the Belvedere. Vienna is very easy to explore on your own, but a guided tour still always has its charm because a real insider has a unique perspective on the sights and lots of stories to tell. Here’s a selection of exciting guided tours you can book. Bicycle tour through classical Vienna – Exploring Vienna by bike is an excellent way to discover the city. So why not take a guided city tour by bike? That way you can see more and burn a few calories at the same time, which you can make up for later with a juicy Wiener schnitzel. 4-hour food tour – Everyone loves food and Vienna really has a lot to offer in this regard. 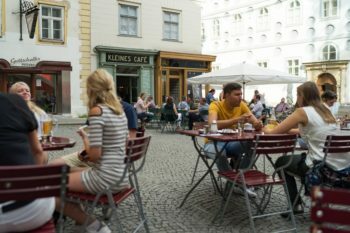 During this tour you’ll visit the Naschmarkt and a traditional coffee house, and you’ll be served excellent food at every stop. Although Vienna often seems tranquil and quiet, with a population of 1.8 million it’s a real metropolis and the second largest city in the German-speaking world right after Berlin. Nevertheless, many sights in the city center are easy to get to on foot. In addition, Vienna also has an excellent bicycle infrastructure that most other European cities can only dream of. Vienna also has a very well developed public transport network. Vienna has 5 subway lines, 29 tram lines, and 140 bus lines operated by Wiener Linien. You can take them to quickly and easily get to all major Viennese sights and attractions. When you buy a ticket, you have the choice between single tickets, day passes, and multi-day passes. 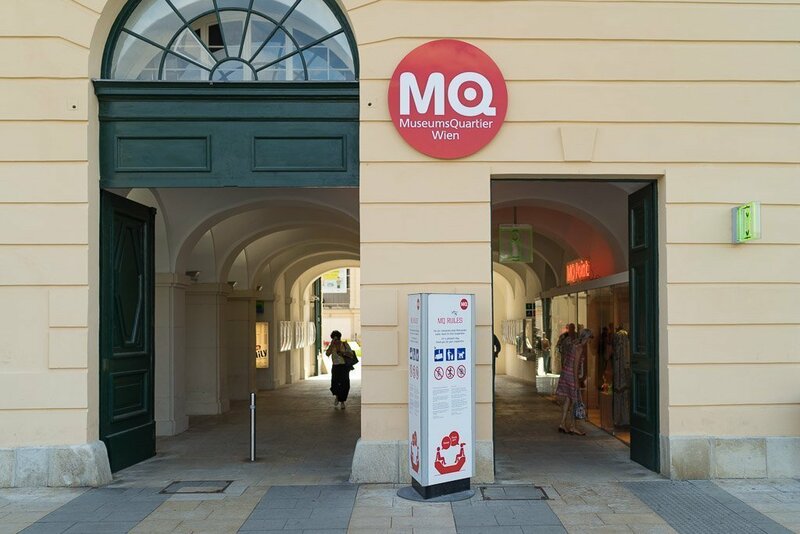 If you plan to visit lots of sights and museums, you might want to look into the Vienna Card (Wien Karte) or the Vienna City Pass, which we’ll cover in the next section. A one-way ticket in Vienna costs 2.20 euros. You can buy the tickets at the ticket machines and in kiosks, which are called Tabaktrafik in Austria. If you plan to travel more frequently, then you should buy a (multi-)day pass that allows you unlimited travel on public transport. The weekly pass is always valid from Monday at midnight through 9 am the Monday after. So if you’re in Vienna from Thursday to Sunday, the weekly pass is the best option. If you’re in Vienna from Saturday to Tuesday, then you’re better off with the 72-hour pass. In addition to the normal tickets, there are also two special offers for tourists: The Vienna Card is an offer by Wiener Linien and Vienna Tourism and the Vienna City Pass is sold by a private company. Both tickets are worthwhile if you want to visit many sights and museums that cost admission. The Vienna Card gets you numerous discounts on sights, restaurants, and shops. Plus, it allows you unlimited use of public transport in Vienna. 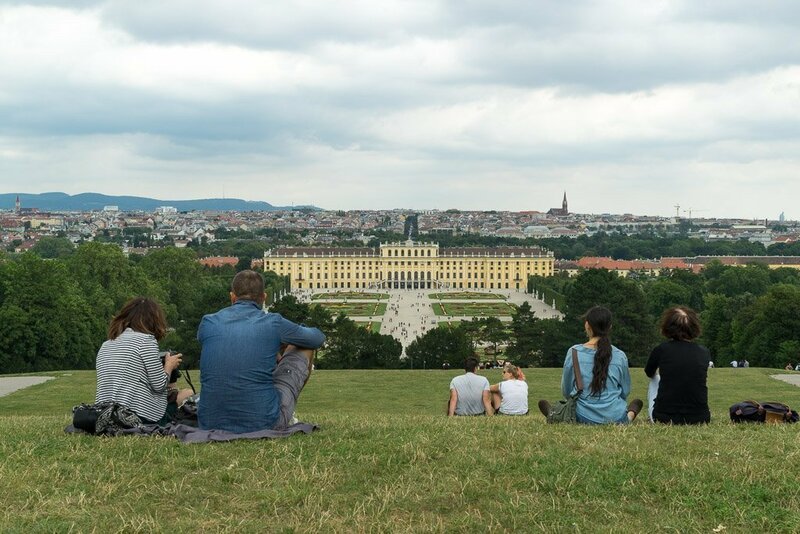 The Vienna Pass grants you completely free admission to more than 60 sights, including Schönbrunn Palace and the Tiergarten, the Albertina, the Hofburg, the Wiener Riesenrad, and the Imperial Treasury. However, the Vienna Pass isn’t valid for public transport. Instead, you can use all 6 lines of the hop-on/hop-off buses, which also take you to all the sights. The following table provides an overview of the prices of the respective tickets and you can order the ticket of your choice online. We’ve written a detailed article on the topic of where to stay in Vienna: The best district to stay in Vienna! Where to stay! In it we show you which district is the right one for you and give you concrete hotel tips in each price range for each district. But we’d also like to give you a brief summary here. Many hotels are located in the 1st district, i.e. the inner city of Vienna. If you stay there, you’ll be very close to the most important sights, but you’ll have to pay a bit more for your room than elsewhere in the city. The 2nd and 3rd districts to the east of the city center are also well situated, but significantly cheaper. There’s also a very large selection of hotels there. We also liked it very much in the 4th and 7th districts to the west of the city center. Although the location of these districts is excellent too, it’s much less touristy there. 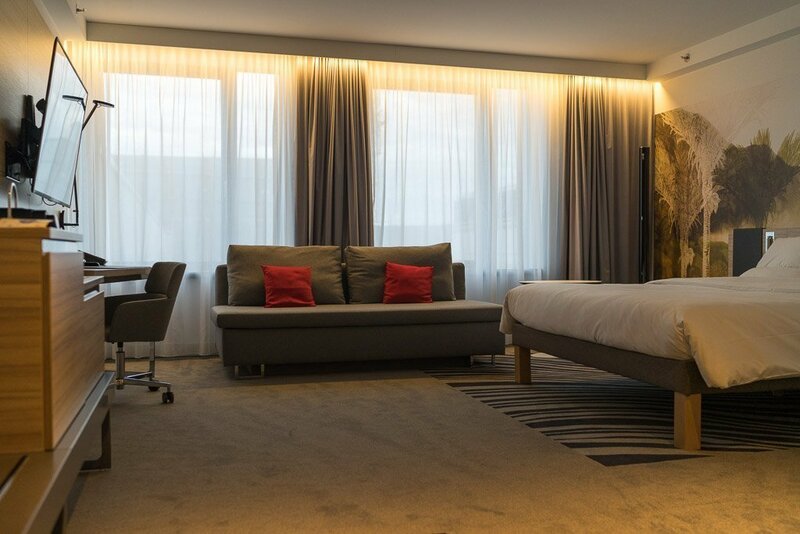 While we were there, we stayed at the Novotel Wien Hauptbahnhof, which is brand new and located right on the border to the 4th district. We can wholeheartedly recommend the hotel, the beds in particular are really comfortable. Our new hotel room in the brand new Novotel by the station. Those were all our tips for Vienna and the best sights. If you’re about to go on a city trip to Vienna yourself, we hope you have a lot of fun in this great city. 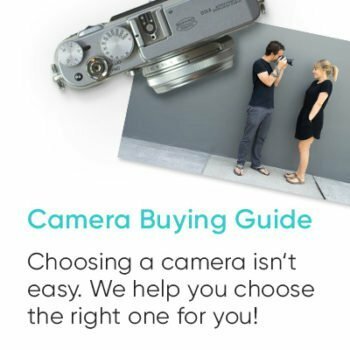 Do you have a Vienna tip of your own or a question? Then please let us know in the comments! 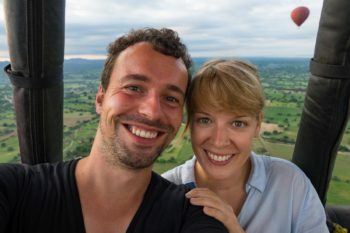 Vienna's hidden gems and spots you shouldn't miss!